The temperature at 7:45AM was 63.2F with a clear sky. Joan spent the morning in the sewing room working on her quilt. I had to take her up. Her 1957 sewing machine her grandmother gave her is portable in the fact it is movable. It is pretty heavy to get in and out of the truck. We have a portable case for it but it would wear out the wheels on it dragging it all the way up there and back. Ron came over for a chat when I arrived back from taking her up. This place is looking empty and one has to concentrate on the street signs now to find their way around. Before, one just looked at the different rigs on the various sites. At 8:50AM the temperature was 69.7F under a clear sky. There was nothing on 14023 kilohertz. The temperature at 9:40AM was 72.7F under a clear sky and the weather station claimed it felt like 76F. We had all the hatches, windows and door open. Beautiful! There was still nothing on 14023 kilohertz. Natasha claims Josie is interested in Brownies and Girl Guides. She sent us a photo of Josie wearing her old Brownie uniform. Not only does it just fit we hardly know the young lady wearing it. We have the photo as desktop background. Last Saturday a seal came in and camped for a day right next to their driveway. Mitch and Josie were quite concerned about it apparently. Josie named it Dalmation because of the black spots on white. This is the seal and the photo is taken from their driveway. 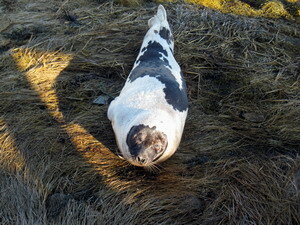 There are so many seals around now you are likely to find one anywhere. Sable Island is now cluttered in them. There are no fish for them to eat and our fishermen are not permitted to hunt them like they did. But lets not get into that. I spent most of the morning sitting outside enjoying a beautiful sunny day. The temperature at 11:25AM was 78.9F under a clear sky and the weather station stated it felt like 78F. It did indeed. I heard nothing to answer on 14023 kilohertz. I gave a number of long CQ calls at 12:30PM on 14023 kilohertz but did not work anyone. The temperature was 85.0F under a clear sky at 1:35PM. The weather station stated it felt like 82F. Joan finished sewing the binding by machine on the second quilt at 1:35PM and now just has the hand sewing left. We spent some time sitting out in the sun and then came into the trailer. It was cooler in the trailer. Joan sewed on her quilt and I had a half hour snooze. At 4:15PM the temperature was 85.2F with a mostly cloudy sky. The cloud was mainly high cirrus. The weather station stated it felt like 82F. It was warm no matter what it was or felt like. We turned both radios off, the amateur radio and the broadcast radio, when we came into the trailer and have enjoyed the peace and quiet. At 6:20PM there was nothing on 14023 kilohertz and we turned the radio off. The temperature then was 78.7F with a mostly cloudy sky. The cloud was cirrus and alto cumulus. The sunset was not much. There was complete cloud cover but the sun did not reflect off the clouds like it normally does. The swmming pool opened at 5PM this evening. They claim some kid crapped in the pool the other day and it has been closed since. We went for a swim at 6:30PM this evening to find Bonnie, Van and another couple in the hot tub. They just found more crap in the main pool. So we crawled in the hot tub and were soon kicked out. They shut down both the swimming pool and the hot tub. The politics of this place is unreal. The last manager lasted four months. They give this new one three months maximum. The rich folks in the park models next to this place closed the gate so we are not allowed over there. They opened the pool at 5PM and found more crap in it at 6PM. Now they do not know who is doing it. It will not be open now until Thursday at the earliest. We arrived back at the trailer at 7:10PM and simply sat outside it was such a nice evening. The cloud cover was solid cirrus and alto cumulus when we arrived home. We could only see the aircraft below the clouds. By the time we came in at 7:40PM we could see some stars and the aircraft above the clouds. The weather report at 8:10PM was temperature 72.6F and a clear sky. The weather here is definitely different to say the least. The day ended with the evening movie again. The temperature at the time was 65.2F with a clear sky and the statement the temperature felt like 65.2F. And another day is history.